With National Monuments Under Review, Bears Ears Is Focus Of Fierce Debate Bears Ears in Utah is on land considered sacred to Native Americans. But some local residents say the 1.35-million-acre national monument is being pushed by extreme out-of-state environmentalists. 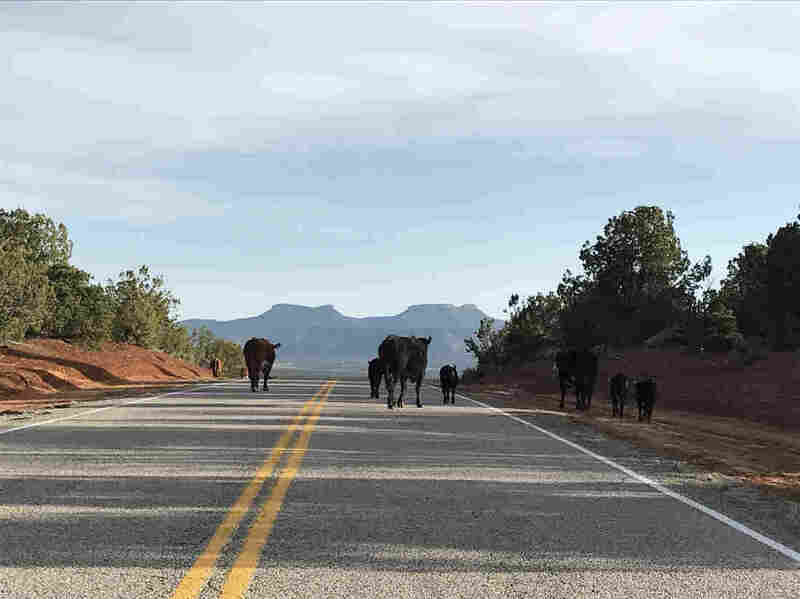 Cattle roam on federal public land beneath the Bears Ears buttes in Utah. When he arrives in rural Utah this weekend, Interior Secretary Ryan Zinke is expected to get an earful about the controversial designation of the Bears Ears National Monument. A lot of the anger over federal public land in rural Utah today can be traced back to a windy, gray day in Arizona in September 1996. At the Grand Canyon, President Bill Clinton formally designated the Grand Staircase-Escalante National Monument in Utah, more than 100 miles away. "On this remarkable site, God's handiwork is everywhere in the natural beauty of the Escalante Canyons," he said. But Clinton didn't set foot in Utah. The planning for the monument was largely done in secret, and state leaders had little warning it was coming. Now, nearly 21 years later, mistrust toward the federal government persists, in the tightknit, mostly Mormon town of Blanding, Utah. Folks can't help but draw a parallel to how President Barack Obama's sweeping Bears Ears National Monument ended up in their backyard. "I don't understand how it would protect the land when you're inviting thousands of footprints in," says Laura O'Donnell. O'Donnell, who works at Blanding's modest visitor center, says she is uncomfortable with her town suddenly being the flashpoint in the heated debate over the future of federal public lands. Interior Secretary Ryan Zinke is keeping a promise to travel into rural Utah beginning this weekend to hear from locals who live around the new 1.35 million-acre Bears Ears monument and the established 1.8 million-acre Grand Staircase monument to the west. The Trump administration has launched a 45-day review over whether large national monuments like these that protect federal land should be rescinded or shrunk. In Blanding, Zinke's visit is highly anticipated. 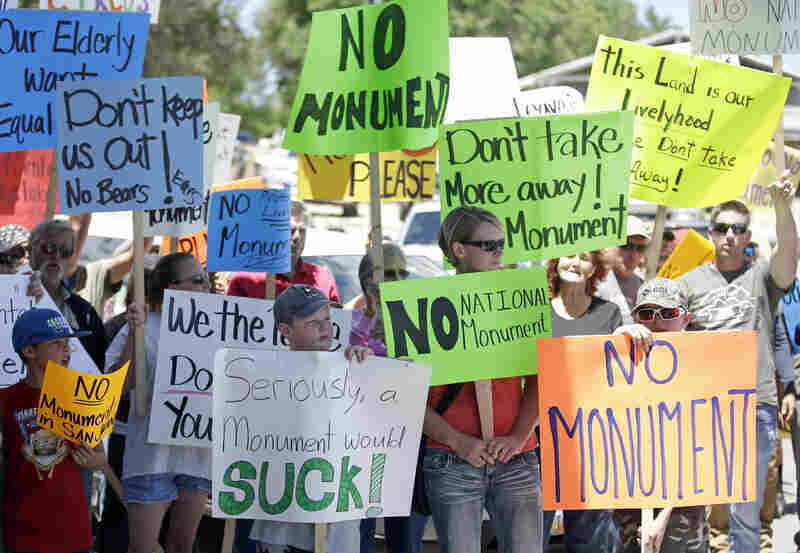 Here, opposition to the monument runs deeper than the usual anxieties in sagebrush country about adding more protections to public land that would restrict future mining and other development. "Monuments should be an honor to an area, and we feel like this one is nothing but a punishment," says Jami Bayles, who founded a group called the Stewards of San Juan County. From her office at a small college, you can see the twin Bears Ears buttes framing the distant horizon out on the vast Cedar Mesa west of town. While not as visually dramatic as the famous national parks nearby, the area is dense with cliff dwellings and ancient artifacts. Opponents of designating Bears Ears a national monument protest after then-U.S. Interior Secretary Sally Jewell arrived for a meeting with San Juan County commissioners in Monticello, Utah, on July 14, 2016. Bayles and many of her neighbors felt offended when the federal government announced additional protections under a new monument because they felt it sent a message that the land was being threatened. "We keep that place pristine, we keep it clean, we check on it all the time," Bayles says. "I guess my argument is, 'OK, yeah, it belongs to everybody, but not everybody has been taking care of it.' "
Bayles says that the monument is being pushed by extreme, out-of-state environmentalists and that her side has struggled to be heard. There are deep pockets behind the campaign to protect Bears Ears. San Juan County is about 50 percent Native American. 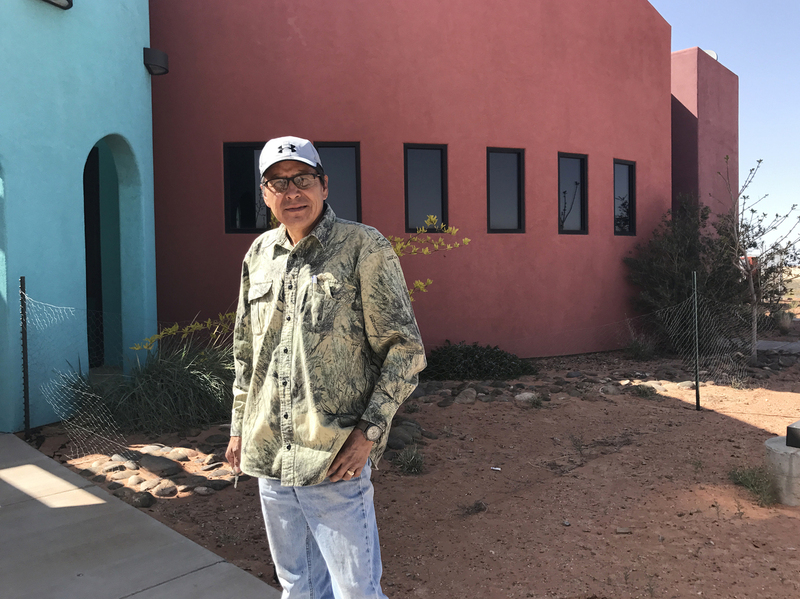 A short drive down the road, on the Navajo Nation Reservation, tribal leaders say it's a lie for people in Blanding to argue that the monument is being pushed on them from the outside. Tribal leaders including Kenneth Maryboy, a chapter president for the Navajo Nation, say tribes around the Four Corners intersection of Utah, Colorado, New Mexico and Arizona welcomed the outside money and help promoting the Bears Ears monument, noting they didn't have a voice before. "For them to be here for 130 years, they should at least understand the Native Americans now," says Kenneth Maryboy, a chapter president. Native Americans from around the Four Corners region, where Utah, Colorado, New Mexico and Arizona meet, who back the new monument are open about the fact that they're getting outside help and money because they didn't have a voice before, according to interviews with tribal leaders. Many tribes in the region have officially come out in support of the monument, though not all. Maryboy was involved with the first talks with Utah's congressional delegation almost a decade ago about protecting Bears Ears as a National Conservation Area. They broke down last year, then came Obama's executive order. "Our gripe and our fight is to preserve what's there, the Native American artifacts, the antiquities and all the shrines and the ruins," Maryboy says. The sacred burial grounds of the famous Navajo leader Manuelito are included in the new monument. Maryboy sees the monument as crucial to protecting these antiquities from vandalism and looting, a historical problem in San Juan County. An ancient petroglyph panel is pocked with bullet holes. 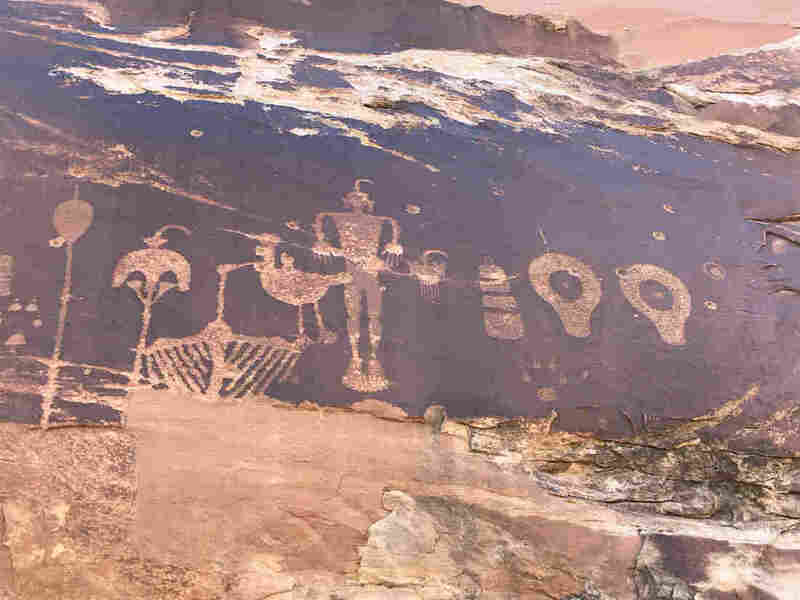 Some say increased federal protection is needed to prevent further damage and vandalism to areas like this one, which is now included in Bears Ears National Monument. "The San Juan County good ol' boys don't want to see this happen," says Maryboy. "They adamantly, openly said, 'This is our land. The damn Navajos need to go back to the reservation.' "
It's not an overstatement to say that Zinke will see deep tension and polarization when he arrives at Bears Ears late this weekend for a two-day tour. Tribes here point to a history of broken promises with the U.S. government. If the Trump administration moves to abolish Bears Ears, it's not hard to imagine a Standing Rock-inspired protest here. On the other hand, if the monument stays intact, some wonder whether the militias that support rancher Cliven Bundy and his sons would arrive in San Juan County. Bears Ears Monument Is A Win For Tribal Food Sovereignty. Will Trump Undo It? Back in Blanding, some locals like Ferd Johnson are floating a compromise. Why not just shrink the monument and protect the cliff dwellings and other antiquities themselves, they say. "All these environmentalists, these Navajos, Hopis and the other Indians didn't even know where the Bears Ears was," Johnson says. "Why is it so sacred if they don't even know where it is?" The tribes dispute this. Some have already signaled they'll sue if, after Zinke's Utah trip, the Trump administration moves to rescind Bears Ears.